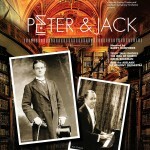 ‘Peter & Jack’, the tribute to baritone Peter Dawson and composer Jack O’Hagan, was a huge success at The Adelaide Cabaret Festival, 7 June 2015. Barry Humphries was narrator and artistic director, Rodney Fisher writer director, Vanessa Scammell musical director, baritone Teddy Tahu Rhodes, soprano Greta Bradman and The Idea of North the singers, with The Adelaide Symphony Orchestra and the Voice of Transition Choir. Jo Gilbert, Jack’s granddaughter and biographer, provided research and guidance in the development of the production. You couldn’t ask for a better combination of wonderfully talented and passionate people. 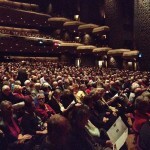 The show received a standing ovation from an audience of around 2,000.
Credit: Peter & Jack program cover, Adelaide Cabaret Festival, 7 June 2015.
Credit: The audience, Peter & Jack, Adelaide Festival Centre 7 June 2015 - a full house. 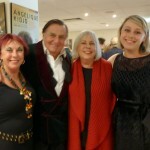 Credit: Left to right, Jack’s grand daughters Janine Dauncey and Jo Gilbert, with Barry Humphries and Eve Gilbert, Jack’s great grand daughter. 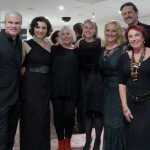 Credit: The Idea of North with Jack’s family - left to right - Andrew Piper (bass), Naomi Crellin (alto), Jo Gilbert, Eve Gilbert, Sally Cameron (soprano), Nick Begbie (tenor) and Janine Dauncey. Credit: The cast with Jack O’Hagan’s family - left to right - Andrew Piper, Greta Bradman, Naomi Crellin, Rodney Fisher (director), Jo Gilbert, Teddy Tahu Rhodes, Eve Gilbert, Sally Cameron, Janine Dauncey, Nick Begbie (kneeling) and Vanessa Scammell (musical director) seated. 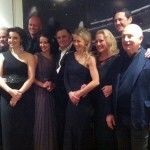 Credit: The Cast and Directors - left to right - Andrew Piper, Naomi Crellin, Teddy Tahu Rhodes, Greta Bradman, Barry Humphries, Vanessa Scammell (musical director), Sally Cameron, Nick Begbie and Rodney Fisher (director). 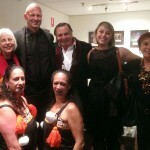 Credit: Left to right - Jo Gilbert, Teddy Tahu Rhodes, Barry Humphries, Eve Gilbert, Janine Dauncey with Maori dancers. Credit: Left to right - Zac Tyler (associate producer) and Teddy Tahu Rhodes with Maori dancers. 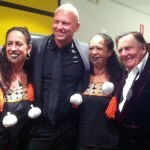 Credit: Teddy Tahu Rhodes and Barry Humphries with Maori Dancers.